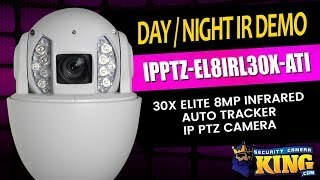 The newest Elite series IP Network PTZ Security Camera is an 8MP/4K Auto-Tracker with 30x Zoom capability. This is an intelligent Auto Tracker Camera, so when tracking is triggered, the camera can zoom in and track the defined target automatically until it is out of the cameras range. This PTZ has a 1/1.7 inch STARVIS ™ CMOS image sensor that works with the light you have to maximize the clarity and night vision capabilities. These are the perfect cameras for viewing large areas that sometimes need an extra set of eyes to catch everything. While they aren’t cheap, think about the cost of dealing with insurance companies, replacing stolen product or repairing damage to your property. With this PTZ and a couple of fixed lens cameras, you will have full coverage and a constant view of your area of concern. This camera is rated IP67 and has been tested and certified to stand up to various situations with dust and water intrusion. It’s also rated to resist 120 lbs of force when hit with an object which makes it Vandal Proof and IK10 compliant. Connect this to one of our NVRs and you’ll be able to control how this PTZ acts and reacts by simply clicking and dragging the mouse and you can do that from anywhere that you have access to the internet! Maybe you have a high traffic area and you’d like to set the camera to focus on that area or maybe you’re home and you get an alert that there’s motion in the parking lot and nobody is supposed to be there. That’s okay because you can simply draw a square using your mouse and that will cause the camera to zoom in and focus on the target thanks to the use of intelligent 3D positioning. With 5 patterns and 8 tours preinstalled, you’ll have enough options right out of the box and you can have up to 300 presets. 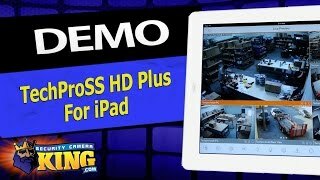 With the IVS (intelligent Video Systems), your camera be triggered to act using options like Tripwire, Abandoned/Missing Object, and even Face Detection. 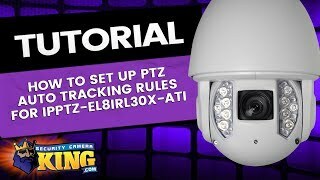 When possible, we recommend that you use fixed lens cameras in conjunction with your PTZ in case the PTZ is focused on the left and someone is sneaking up on the right! 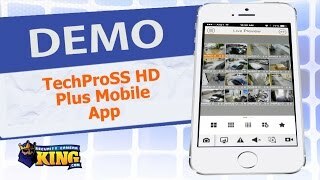 It’s time your cameras work for you to accomplish your goal of keeping what’s yours safe. You’ll have the ability to see in the dark thanks to the built-in LEDs that provide up to 656 feet of IR (Infrared) light. Another great feature with this auto tracking PTZ is privacy masking. Privacy masking allows you to mask out things that might cause unwanted motion events such as trees swaying in the wind and clouds rolling by. All you have to do is literally draw over those unwanted areas with your mouse in the viewing screen. You can conveniently back up footage to a Micro SD card up to 128GB or use one of the available USB ports to plug a flash drive in that can have specific footage saved to it that needs to be easily shared with coworkers or possibly police. This comes with a wall mount and a 24V AC power supply but if you don’t have a power outlet readily available, you can always use network cable and the High-PoE option. Your new Elite series PTZ camera includes a 2 year warranty, FREE US based tech support and FREE remote viewing apps.